We are settling into a new rhythm around here. We are generally outside more, the littlest of my wild ones is just coming out of his nap time, and I have been busy with our summer farming plans. All of that is to tell you that this amazingly awesome science project for kids I am about to share with you might very well be old news. 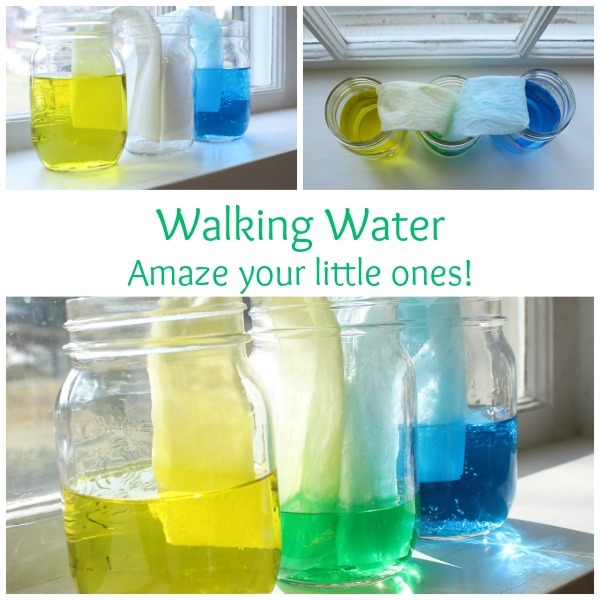 I had a bit of time to puts around on Pinterest a little while ago, and found this neat science experiment on walking water by Science Sparks. I immediately remembered doing this neat activity when I was in teacher’s college and knew that my little ones would get a big kick out of it. As will you Mama! It is super easy to prepare and quick for the results to happen as well. It is full of learning – wonderful big words like absorption can be used, and colour mixing can be played with in so many ways. We filled two of the mason jars about half way with water. 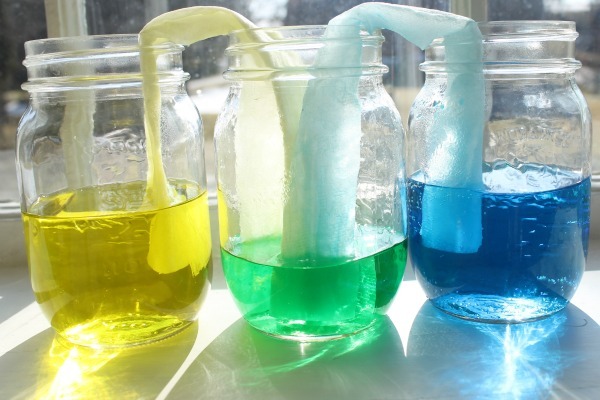 Then we added a few drops of food colouring, we did blue and yellow. I would highly recommend sticking to the prime colours. Then, we folded two sheets of paper towel into long thin rectangles. We arranged the 3 mason jars on a desk, with the empty jar in the middle. 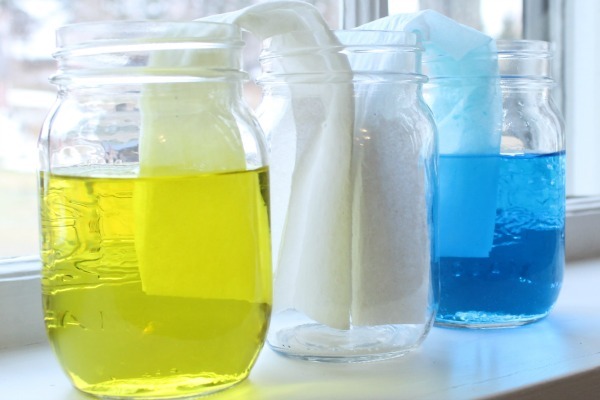 Then we put the paper towel into each jar, and curved them over into the empty jar in the middle. Next we waited and watched, waited and watched, waited and watched. The water slowly started to creep up the paper towel. After about 5 minutes the boys got a bit ansy with the waiting and watching and started to play. After another 5 minutes Mama got a little ansy about the jars full of food colouring being in the midst of said play and they were moved to the window ledge. I think it was about 20 minutes or so when the water started to drip into the empty jar. 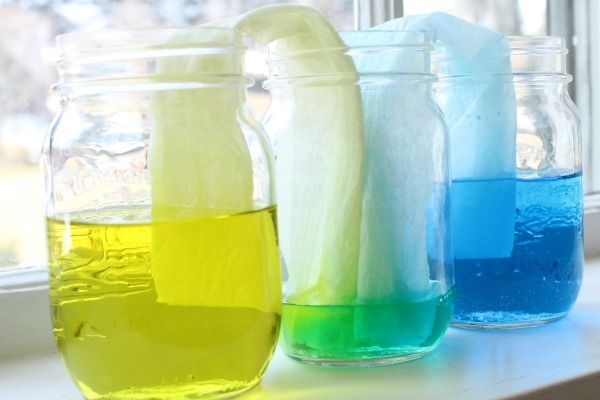 A few drips of blue, a few drips of yellow, and very soon green appeared in the middle jar. Voila! There is a lot of science that could accompany this lesson of course. But with the age of my little two, we simply did some chatting about our observations and marveled at the magic and wonder of it all. I will teach them all about absorption and big scientific ideas when they are big. Right now my focus is on giving them as many experiences and amazing, beautiful things to talk about as possible. When they are bigger, and learning about absorption they will have great experiences to draw on. But no rushing. We are fully embracing the innocence of childhood and letting them stay little around here. Please consider liking us on Facebook and Pinterest! Thank you.